During the preparation for my third year project I was playing around with the Xilinx Spartan-3E development board. The book I used had some application examples for 7-segment displays, which were not available on the S3E board. I had some of these LED displays in my parts box and decided to build a plugin (picture below). 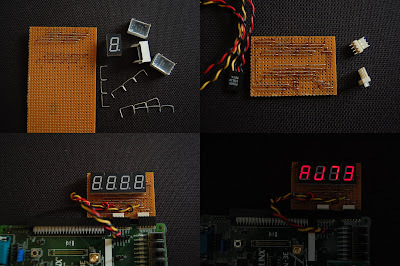 The displays are multiplexed in order to reduce the number of I/O pins used.